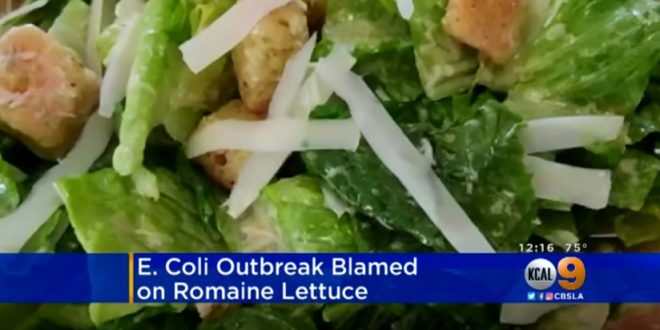 CDC Issues E Coli Warning For Romaine Lettuce - Joe.My.God. The CDC is advising consumers not to eat any romaine lettuce, and retailers and restaurants should not serve any because an outbreak of E.coli is being linked to it. The CDC published a food safety alert Tuesday afternoon on its website. Consumers who have any type of romaine lettuce in their home should not eat it and should throw it away, even if some of it was eaten and no one has gotten sick, the CDC says. If you do not know if the lettuce is romaine or whether a salad mix contains romaine, do not eat it and throw it away. The warning covers all types or uses of romaine lettuce, such as whole heads of romaine, hearts of romaine, and bags and boxes of precut lettuce and salad mixes that contain romaine, including baby romaine, spring mix, and Caesar salad.